Authorities surround monastery and issue 48 hour ultimatum for protest organizers to surrender. Around 100 monks staged a candle-lit vigil and protest outside the government headquarters in Mangra (Chinese: Guinan) county, Tsolho (Chinese: Hainan) Tibetan Autonomous Prefecture, in Qinghai on Wednesday [25 February 2009], the first day of Tibetan New Year (Losar), according to reports and images received by the Tibetan language service of Radio Free Asia. The images, which can be viewed on ICT's website: depict monks from Lutsang monastery holding candles in memory of Tibetans killed in the ongoing crackdown following protests across Tibet since March 10, 2008. The monastery is now surrounded by armed police, with an ultimatum issued today [27 February 2009] for the organizers of the protest to "surrender" within 48 hours, and for any monks who own a portrait of the Dalai Lama to be expelled from the monastery, according to RFA . In Lhasa, the mood was somber among Tibetans and the atmosphere bleak, with security personnel apparently outnumbering pilgrims in the Jokhang Square, and fireworks being lit by People's Armed Police, but not by many locals, according to a blogger on February 25 . The same report said that Party members; they were told that they must celebrate the New Year and "be vanguards of this life or death-struggles [against the Dalai Lama]" and that they "should not drink" and "can't turn off their cell phones for 24hrs". "First, China should understand the aspirations and thoughts of the younger Tibetan generation. Second, China should understand that this year's  boycott by Tibetans of Losar celebrations could be more widespread than last year's  protests." They also said that they were holding the candle-lit vigil in memory of the people killed during the Chinese authorities' crackdown on the protests last year , and as a "New Year's gift to Tibetans inside and outside of Tibet." After half an hour or so, the monks were persuaded by Tibetan government and Party officials who had emerged from the building - as well as senior Tibetans - to return to their monastery. RFA is also reporting a similar protest at Dhitsha monastery in nearby Bayan Khar (Chinese: Hualong) county, Tsoshar (Chinese: Haidong) Tibetans Autonomous Prefecture, where the Director of Qinghai United Front Work Department, Dorje Rabten, reportedly "educated" the monks to be "patriotic" to China and return to their normal routines. Lutsang monastery was the scene of peaceful protests on March 10 of last year , when monks and local lay-people took to the streets in another peaceful protest to mark the 49th anniversary of the Dalai Lama's flight into exile. Sources close to ICT have said that the protest on March 10 last year , followed by another in the same county but at a different monastery on March 17 , passed without major intervention by the Chinese authorities, possibly due to the presence of senior Tibetan government and Party officials in the area. There are now serious fears for the welfare of monks at Lutsang, at a time of deepening tension in Tibet due to sensitive upcoming anniversaries and the Chinese government¹s hardline response to any expression of views that may run counter to those of the state. 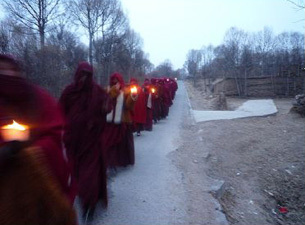 Yesterday [26 February 2009], when the protest in Mangra took place, was the start of a two-week-long festival marking the start of the new year in the Tibetan calendar. But all over Tibet a popular movement has grown where people have chosen not to celebrate the event as they normally would, and are instead marking the new year in mourning for the people killed during the Chinese authorities' crackdown on last year's protests, and in solidarity with the hundreds and possibly thousands of people who continue to be detained and 'disappeared'. This New Year passed quietly without any incident. As matter of fact, it was so quiet that if the patrolling soldiers had not set off spectacular fireworks, we did not know it was the New Year. Before the approach of the New Year, the government "cleaned up" all undesirable people. They locked up thousands of Tibetan pilgrims, monks, students in a detention center in the eastern suburbs and drove thousands of them to their respective homes. What remains in Lhasa are the people who have temporary permit cards and the residents of Lhasa. As the New Year approached, the different government units held meetings about the coming New Year and announced that all government officials had to celebrate the New Year; that as is customary, fireworks must be let off, all window and door hangings must be changed, and all the prayer flags on roof tops must be renewed. There were some special tasks for Party members; they were told that they must celebrate the New Year and be vanguards of this life or death-struggles; they were also told that they "should not drink" and "can't turn off their cell phones for 24hrs". On New Year's Eve, the security guards and the local committee members changed window and door hangings and all prayer flags near the Jokhang temple, and they went door to door to ask people to change all these things. On the eve of the New Year, the People's Armed Police, the security guards and plain clothes security personal were patrolling every alley way, on every street corner and public square. There were more security personel in the Barkor and the Potala squares than Tibetan pilgrims; these places were virtually empty apart from them. As I walked around the Jokhang temple, I felt that the atmosphere was very tense and intimidating. Occasionally, we could hear fireworks, but these were displays by patrolling solders and working units. It went on in the same way till mid-night. What I observed was that most fireworks were set off by the PLA and the working units. On the first day of the New Year, most Tibetans still did not change their window and door hangings and they left the old prayer flags on the roof tops. There was no dancing and singing in the streets; very few people in the streets. All people (including many officials and cadres) I talked to said that this New Year is different and compared to previous years, this New Year is not a New Year."